Did you know we have a E-newsletter for Families, Children, & Youth Updates and Programming News? Sign up here! We provide children, youth, young adults, and adults consistent and continual opportunities to explore, reflect, and learn in a nurturing spiritual community. Social growth – connecting with peers and people of all ages on a deeper level. Finding acceptance among people beyond the superficial. Parents and guardians, please register children and youth for religious education programming. We ask families to register their children for religious education. This is essential to our programming and ensures that care providers receive information about classes, weekly emails, and timely updates. For information about scholarships contact Reverend Stephen Furrer. Please click to download a copy of the 2018-2019 R.E. calendar. Children and youth are invited to attend one of the following Sunday morning R.E. programs, offered concurrently with both the 9 and 11 a.m. Sanctuary worship services. Each Sunday morning in Spring Hall, we offer an innovative 9 a.m. program. During the Sanctuary 9 a.m. worship, children and youth meet in a multi-age setting to explore the principles through play and practice. We integrate worship, ritual, songs & music, story, and curriculum activities to provide a meaningful way to build community and explore spirituality, together. Children ages 4 or 5 through high school will have opportunities to enhance self-confidence, nurture multi-generational relationships, and ask important questions. 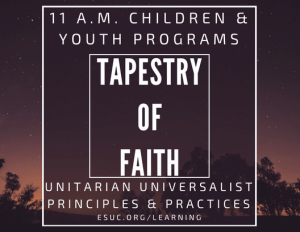 Our 11 a.m. programs are aged-based groups using the Unitarian Universalist Tapestry of Faith curriculum. 9-12, High school youth group: youth-selected Tapestry of Faith curriculum, along with monthly social and volunteer activities to develop community, deepen values, and explore spirituality. Write to coordinator@esuc.org to join our Facebook group and weekly newsletter. How can I get participate? Our R.E. 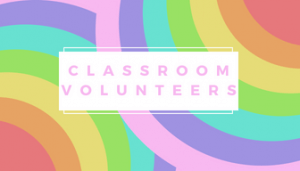 classes are all volunteer-lead. Our staff support volunteer congregants, providing training, assistance, and preparation for the classes. Parent/guardian volunteers are asked to help four times each church year, with classroom, prep, or special events. R.E. teachers are in the classrooms at both 9 and 11 a.m. programs, one to four times a month. What if I’m a visitor? Visitors and guests are welcome to attend most of our Sunday morning Religious Education (R.E.) programs on a drop-in basis; it’s a great way to get to know our faith community! On the third visit we request that the family registers their child for class. Click here to register for R.E. Stay in touch with our weekly R.E. newsletter! Each week, we email out updates regarding our programming, events, and other important information. Click here to sign up. Aisha Hauser, Director of Lifelong Learning for general information, and for support for your family and children. Amanda Uluhan, R.E. Programs Coordinator for children and youth registration, and how to get involved volunteering or teaching. You can learn more about our staff who work in the Lifelong Learning department at East Shore here.